Nice to see such a great mention of my 2001 novel-in-verse The Emperor’s Babe in an Evening Standard piece by Mary Beard. 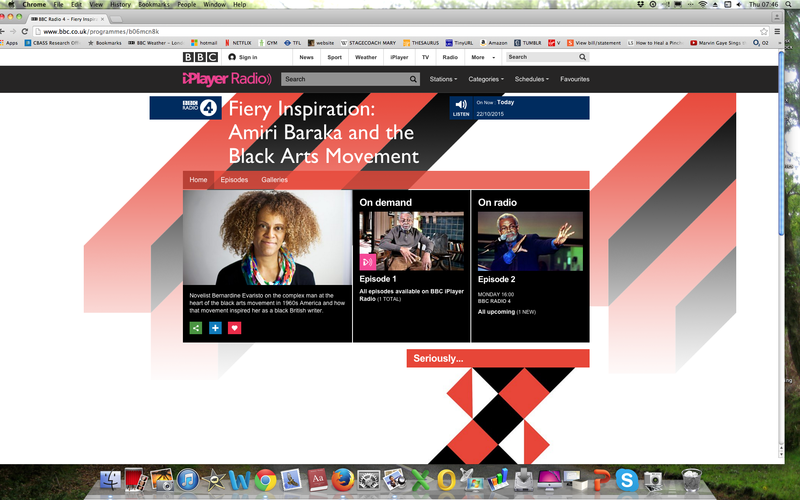 I’ve just made a 2-part BBC R4 doc on the above with fab Front Row producer Ekene Akalawu. Marlon James’ Man Booker win is staggeringly amazing on so many counts, not least because he’s only the SECOND black writer to win it in nearly 50 years, and the Prize has only ever had one black judge (this year), and 2 Asian judges. (The media won’t mention this.) It’s so blatant it has always felt like a statement. I can really appreciate how his win signals renewed hope for many writers of colour. The Prize is a career-maker, for sure, but will it also be a game-changer this time? When Ben Okri won it 25 years ago, it did not improve the fortunes of black African novelists. It took the The Caine Prize for African Writing to do this with its profile-raising winners, shortlists, anthologies and annual workshops in Africa, attended by many aspiring writers including Ngozi Adichie. Trend-watchers will observe that the industry has already slowed down in publishing African fiction (as we predicted…) and will probably turn its attention instead to Caribbean fiction, which has been shamefully overlooked for decades. ‘Where is the next Marlon James?’ it will ask. The fact that the decision-makers in the industry are from a demographic that is 99% not from an African-origin background is a huge factor. Some prizes aim to raise the profile of whole continents, countries and demographics, such as the OCM Bocas Prize for Caribbean Literature; The Complete Works II-Promoting diversity and quality in British Poetry, Paul Burston‘s Polari First Book Prize for LGBT writers, Kwame Dawes’ African Poetry Book Fund, and my own, Brunel University African Poetry Prize –http://www.africanpoetryprize.org/. As well as publishing initiatives such as Jacaranda Books Art Music Ltd. And let us not overlook Peepal Tree Press, which has spearheaded publishing great Caribbean literature for the past 25 years. I’ve watched publishing trends for thirty years and one person winning a major prize does not always change the game. It has to be backed up by work on the ground and publishers with a serious commitment to representing all kinds of writers – forever, not just as the latest trend. Audio Interview with me by Tyrone Ali at Bocas Litfest in Trindad, April 2014. Living a lie might make life easier in the short term but usually means denying a fundamental part of yourself – which is sure to create problems in the long term. Whether the lie springs from being in the wrong career, spending more money than you have, or living with someone you do not love, the shaky foundations on which you build your life will show their cracks eventually. For the sake of your own future, we urge you to come out of hiding now. Spend time in the company of irresistible Barry, the ‘loverman’ of Evaristo’s joyful novel, and be energised into putting all your cards on the table right now. When Barrington Walker and Carmel were in their twenties, they were the hottest couple on the dance floor. Both tall, beautiful and graceful, their relationship was the envy of all in their native Antigua. Moving to London and having children seemed to cement their bond – and there, for the next 50 years, Barrington lived a lie. Because since he was 14 in Antigua, he has loved Morris; and Morris – who also married and moved to London – has loved him back. Gay love being still illegal and socially unacceptable in the Caribbean, however, the two men were never able to express their love openly – and they brought their social strictures with them. Over the years they continued to meet in secret, spending the night together whenever they could; but even when Morris’s wife caught them in flagrante, resulting in divorce, Barry still bottled out of declaring himself, unable to face the reactions of his family.